Young Professionals Green Energy Awards 2016 took place on Thursday 26 May in Glasgow and played host to over 300 members, guests and friends from around the world for an evening of entertainment and, most importantly, recognition of the contribution being made by the next generation of thinkers, shapers and decision makers. Dr Adrian de Andres, a postdoc in IES, was awarded with the Academic Award. 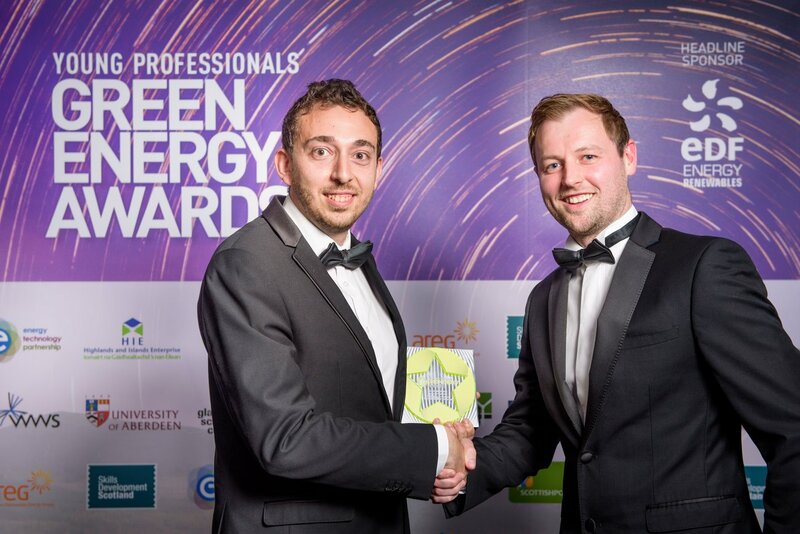 This award recognises Adrian's brilliant career within the wave energy sector, specifically within his research line the techno-economic assessment of marine energy converters. This research (techno-economic assessment of marine energy converters) has a vital importance to the marine energy sector due to its current situation. Bridging the gap between technology and policy is key for the success of the sector. This importance of Adrian's research has been highlighted by the high number of citations of all his papers on the last two years (more than 50 citations). This demonstrates the importance of his work and its recognition by the international community.